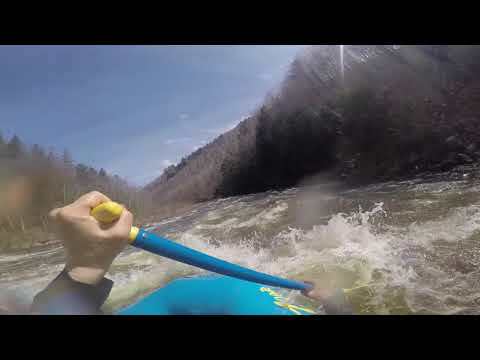 Enjoy an active Vermont vacation on the Class III and IV rapids of the West River near Stratton Mountain, one of the state's hidden treasures and your only opportunity for Vermont whitewater. This intermediate-level white water rafting trip is an ideal way to view the fall foliage or the spring thaw. We welcome rafters ages 10 and up on this popular Vermont whitewater rafting trip. Our base of operations for the West River trip is the Main Base Lodge at Stratton Mountain, southern Vermont's premier four-season resort. With an alpine village, full amenities, comfortable accommodations, and a large meeting space, Stratton Mountain is the perfect starting point for a great spring or fall adventure! We put in at Ball Mountain Dam, where water is released for the trip. Our first taste of big whitewater comes as we head into Landslide rapid. Several miles of continuous rapids later we meet our biggest challenge at the Dumplings where negotiating the river's natural s-turn pushes each raft's paddling skills to the limit. We stop by the riverside for a brief snack and have opportunities for swimming before taking out below the route 100 bridge. Back at Stratton Mountain a hearty meal and the trip's slideshow provide a fitting finale to this unique adventure. Participants on West River trips should be prepared for a fairly strenuous walk down a steep rocky trail at the beginning of the trip. Participants on this trip may be required to swim aggressively in rocky, fast whitewater. For our West River trip, The Wilmington Inn provides trip and local lodging packages. Just visit their website to check pricing and availability. How many people usually fit in a boat? Our West River trip meets at 10:30 a.m. We meet at the Main Base Lodge at Stratton Mountain in Stratton, Vermont. Please try to be on time, since we must work within the schedule of water releases decided on by the Army Corps of Engineers. You will be required to read and sign a release of liability at this time. For all of our whitewater trips, guests must be able/willing to do the following: Wear a helmet and our personal flotation device (PFD), respond to and follow verbal or visual instruction, roll from front to back in water while wearing a PFD, demonstrate dynamic sitting position (sitting upright), and float with feet up in water. Specifically for the intermediate West River trip, guests should be able to paddle in the rapids, but with frequent rests. Remain calm, lay flat, and orient their body so their feet are aiming downstream if they find themselves unexpectedly in the water. On the West trip, guests need to be prepared to spend a longer period of time in the water with an unexpected swim, and should be able to swim to the nearest raft or shore in current. Our PFDs fit a maximum chest size of 56 inches. Don't forget to read your confirmation letter (there is a lot of useful information in there!). And remember: This trip does meets at Stratton Mountain in Vermont. Please click on the Directions link on this page for more details. Feel free to call our office if you have any additional questions. We're always happy to help! The West River trip meets at the Main Base Lodge at Stratton Mountain in Stratton, VT.